Red, bleeding gums, sensitive teeth, and persistent bad breath — do those symptoms sound familiar? If so, chances are good that you could benefit from periodontal therapy in Medford. The majority of American adults experience gum disease to some extent, and when caught in its earliest stages, the condition is easy to reverse. Your trusted dentist, Dr. Gary Rosenfeld, provides expert treatment for gum disease for Medford friends and families! During your regular checkups and cleanings, we will monitor the health of your gums and measure any periodontal pockets to assess the need for periodontal therapy or additional preventive attention. Gum disease affects people of all ages, but the risk rises after age 35 and then again for people older than 65. Make yourself aware of the symptoms of gum disease to ensure you receive treatment promptly if needed. In the beginning stages, gum disease is usually easy to reverse with improved dental hygiene habits at home and a few extra visits to our office for additional cleaning. But once the periodontal pockets, or the areas where bacteria live, have reached a certain depth, we will recommend a deep cleaning. Also known as scaling and root planing, it is a nonsurgical treatment in which we remove bacteria around and below the gum line and then smooth the tooth’s root to prevent inflammation and reinfection. 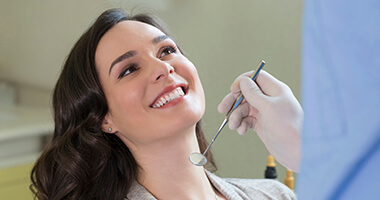 Scaling and root planing is carried out over multiple appointments to your Medford dentist. Local anesthesia and nitrous oxide are available to ensure you are comfortable throughout each step of the treatment. The bacteria that causes gum disease is stubborn and multiplies quickly, so to fully heal the gums of the infection, antibiotic therapy is usually combined with scaling and root planing. In the most advanced cases of gum disease, when the infection has already begun to eat away at the bone tissue, your dentist may recommend surgical treatment to heal your mouth and prevent the loss of teeth and bone associated with periodontitis. After we have helped heal your gum disease, ensure you are maintaining excellent dental hygiene to prevent its reoccurrence. Brushing your teeth for two minutes, at least twice a day and flossing daily are two critical habits for preventing gum disease. Avoid tobacco and stay on top of your routine visits to your Medford dentist. Try to reduce the amount of sugar you eat, and maintain a nutritious, balanced diet to enjoy better oral health overall! If your periodontal health is lacking, don’t hesitate to get in touch with the team at Island Daily Dental Care. Healthy gums are an important aspect of solid overall wellbeing. Request an appointment for gum disease treatment in Medford today!